The Kronosaurus is a playable aquatic creature in Beasts of Bermuda. It has incredible short-range dashing speed, making it a profound ambush predator. However, since its sprinting speed is very mediocre, it's not good at chasing. Nonetheless, it is regarded as one of the most dreaded predators in the game, as it can almost kill many creatures with a single strike. For those who survive its strike, they will be left severely crippled, allowing the Kronosaurus to strike again and land a finishing blow. Its biggest rival is the Mosasaurus, which is also an extremely deadly aquatic predator that competes for the same food source. However, the Kronosaurus has an advantage battling the Mosasaurus due to its greater damage. Primary Attack: The Kronosaurus performs a quick, but very powerful bite. This attack costs a very high amount of ability power, letting it bite up to 6 times before all its ability power is depleted. Secondary Attack: Upon holding down the Secondary Attack button, an icon appears on the screen resembling an empty bar, which begins to slowly fill up; The Kronosaurus is preparing to strike for massive damage! The more the bar is filled, the more damage it will do when unleashed (maximum charge is indicated by a flashing blue color). Upon letting go of the Secondary Attack button, the Kronosaurus launches forward, damaging anything it rams into along the way. A charge will automatically be unleashed if ability power runs out while charging. 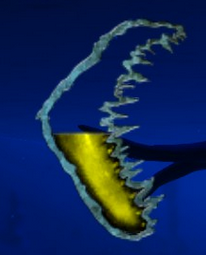 The bar icon used for the Kronosaurus' Secondary Attack. Here it is shown halfway charged. The Kronosaurus' immense strength is offset by its terribly sluggish swim speed. Its charge attack doesn't solve this either, as the initial charge-up requires the Kronosaurus to be immobile for the first few seconds. This makes the Kronosaurus quite vulnerable to fast attackers, especially those that gather in large groups, such as the Elasmosaurus and Pteranodon, since the Kronosaurus can neither chase or escape from them due to their faster speed. The Kronosaurus' only hope against these attackers is to predict their movement and retaliate with good timing. The Mosasaurus also proves to be a competitive threat, but the Kronosaurus has just the upper hand due to its higher healthpool. As is the case for all aquatic creature, the Kronosaurus can become beached if it's not aware with the changes in tide level, or clumsily jumps onto the land. 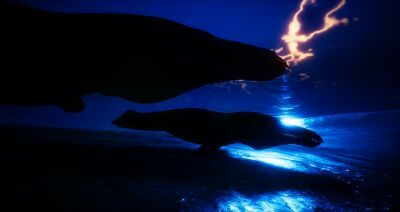 The Kronosaurus is the largest creature with the Elusive talent, which lets it become almost invisible to other players. However, due to its expensive requirements, it may not be worth the time unlocking. Of all the aquatic creatures, the Kronosaurus is the slowest, and leaps the shortest too. This page was last edited on 4 April 2019, at 06:22.